While we were losing hope of the rick-replacing, CNG powered, Bajaj pocket rocket to ever make it into production, sources have confirmed that a 2012 launch is imminent. 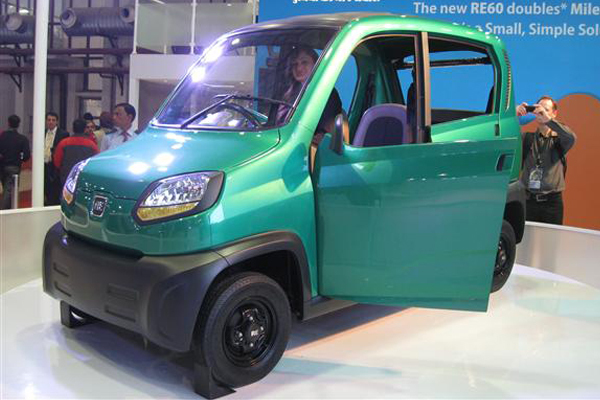 Eyeing to replace the notorious auto rickshaws, Bajaj gave a demonstration of the RE60 four-wheel passenger carrier. The Indian auto giant is a market leader in three-wheeler segment and offers the RE60 with the glorious 200 cc engine it has mastered with. Sources claim that a late Diwali launch is scheduled for the RE60, but Bajaj auto did not give any word on it. The delay is practical, looking at the rising fuel prices and Diwali will attract more customers around the country. The Bajaj RE60 will be platformed alongside other three-wheelers built by Bajaj at the Aurangabad facility. Bajaj Auto offers a competitive price tag for the RE60, pegged at Rs 1 lac, which is at par with the auto rickshaw prices. Moreover, the Indian auto giant carves a new car segment with the launch of the RE60. Offered as a commercial people’s carrier, the Bajaj RE60 will be offered in an entry-level trim and a feature-packed high-end variant. There have also been reports of Bajaj coming up with a commercial load carrier after the passenger carrier version, which will offered with CNG kit, besides the petrol trim. Speaking of which, powering the RE60 is Bajaj’s glorious 200cc, liquid cooled, single cylinder petrol engine that delivers a good 20 bhp peak power. Besides the mouthwatering price tag, a spectacular 35 kmpl fuel-economy is also a major selling point for the new cat. Moreover, the RE60 will set benchmark with an impressive 60 g/km of CO2 emissions. We had recently brought you the news of Renault-Nissan analyzing to source the Bajaj RE60, and just within weeks, the news of RE60 launch hits the board. The car is built under ultra low cost (ULC) car project with a Nissan-Renault and Bajaj collaborative venture. Initially, Renault-Nissan appointed Bajaj to build an ultra low cost people’s carrier, and the RE60 was built in response. The duo planned to sell the car with their badge, but did not confirm the design to Bajaj. We have to wait a little longer to see the pocket carriage cruise our city streets.